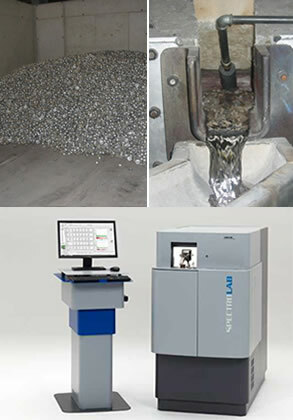 Products and facilities | Alusigma S.A.
Alusigma S.A. produces different aluminum ingots families such as EN-AC 46000, EN-AC 46500, EN-AC 47100, EN-AC 44300, EN-AC 44100, EN-AC 43400, EN-AC 46400 and EN-AC 46100, under custom specifications for each client. It also has capacity to manufacture special alloys and alloys with specific nucleation specifications. Main customers of this product must are: Martinrea Honsel, Groupe Arche, Volkswagen, JL French, Sandhar Technologies, Cie Automotive, Fagor Ederlan, etc. 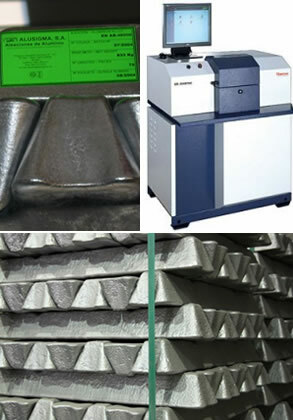 Alusigma S.A. has capacity to produce aluminum alloys in other formats, such as semi-spheres or pyramid trunks. Smelting and maintenance furnaces, equipped with gas cleaning systems. Casting lines: ingots, pyramid trunks and semi-spheres.